Can a city revolt even when morale is at 70% and with almost 1500 naz parked on top of it? And add another 90mil gold that got dropped into the city for troop training purposes. Once you make that much investment, shouldn't the city not revolt? the amount of pez, pluss how hench they are. I see. I think the city had 63k pezzies left after all the training that refused to be moved to the army. And with only 1500 naz .. that's only 37.5k pez they can handle. You're right I guess. City revolted again and I had closed the doors of the city. Now my army is trapped inside the city. I apparently can't prep with closed doors unless I move and I can't move the army. WTH is this! VU's high! 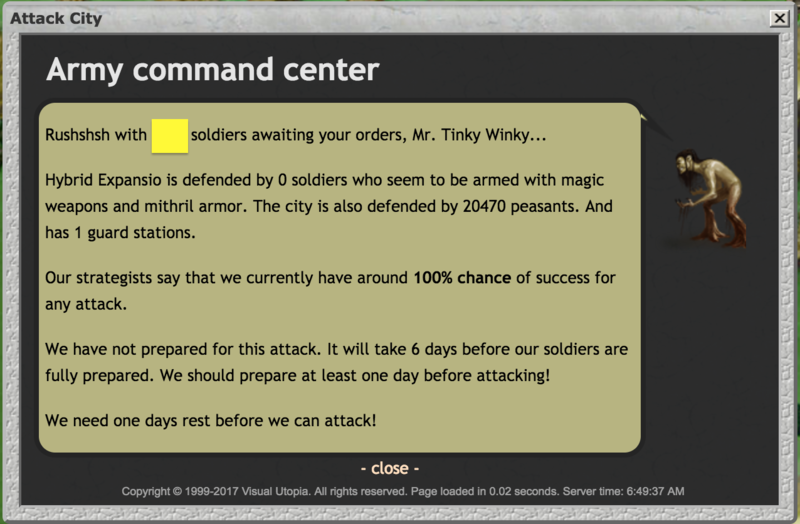 Hybrid Expansio is defended by 0 soldiers who seem to be armed with magic weapons and mithril armor. The city is also defended by 19327 peasants. And has 1 guard stations. We have not prepared for this attack. It will take 6 days before our soldiers are fully prepared. We should prepare at least one day before attacking! We need one days rest before we can attack! 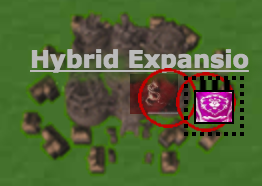 We are trapped in Hybrid Expansio. We need to attack the city to break out! Yeah the only difference is the army has been "prepping" the city on top of it for like 4 ticks now and the "need one days rest" still shows up. That prep counter isn't going up! I guess I didn't explain it right in the post above. And no, I'm not frozen. I guess I'll have to get another army to help out. K. Literally all I see .. for 4 ticks now. I don't get any options. It's an all nazgul army that's why walls don't show on the prep. Can't move. Yeah merging with a scout made it work. No, move the army just a little bit. And it will say - we are trapper, order attack on the city? edit: Bling, being in the game for so many years, these are simple things, you would know this, why not help the dude?